Basic Juice - the wine blog for my generation: I can't believe it's not Stelvin! There are those who cling to the 'romance' and 'tradition' of popping the cork prior to imbibing. Then there are those who think such 'romance' and 'tradition' are ridiculous if these totems potentially mean stinking, spoiled wine. Both camps have valid points. I'm a sentimental, shmoopy sucker for the romance involved in popping the cork. But then, If I've dropped 40 or 50 clams, and my just-popped bottle of wine smells like a box-full of soggy, old Boys Life magazines, I set up camp amongst the pro screw-cap crowd. Must the wine lover chose between faulty corks and sterile Stelvins when it comes to bottle closure? Would that there were a closure, which could preserve in an aesthetically appealing manner. Thank the cosmos for Vino-Lock. This glass stopper is much prettier than a Stelvin and, of course, more reliable than cork oak bark cylinders. Just a few weeks ago I took home the first glass-stopped wine to appear in the wine shop. I loved it. And the wine wasn't too bad either. Cusumano IGT Sicily Merlot 2006 ($12) - A simple, exuberant Merlot made more appealing by its aesthetically cool glass stopper. This inky-purple wine offers scents of cherry jelly and baked strawberry. Its flavors a simply tangy fruit. 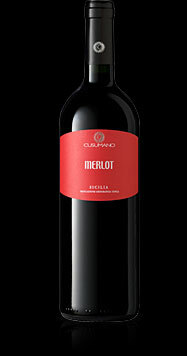 Cusumano Merlot is nothing if not pleasant and eager to accompany pizza. The Heinrich Red from Austria also has the glass stopper. I like the glass stopper (and the wine) a lot. We would like to introduce our website, http://www.foodtube.net/ It's similar to youtube except that it's all food videos. You can find video recipes from many countries around the world. You can also add your own video, or star in your own! Thanks for checking out the website. Please spread the word. Have fun! Although it would be really great to see you pop up more often in my rss reader, I can certainly understand when things get busy or complicated. Basic Juice is one of my hands-down favorites and of coourse,congratulations on your other work...the print world needs a huge booster shot of writers like you in their midst. Thank you for Basic Juice, take care and I'll look forward to reading you. I totally hear you on the "romance" involved with popping the cork as opposed to unscrewing the bottle like an old 3 liter of pepsi. While I've been a bit of a traditionalist in corking, I'm anxious to see if Yellow Jersey wines make any waves in their PET packaging. Apparently its a hard resin material that can be recycled...AND its shatter proof. I want to see if our wine educator, Gilles, thinks of it. I love the wine here. As a wine lover, Im the first to get excited about opening a new bottle, especially one that Ive been storing for a while. I would say that at least one out of every 6 bottles that Ive "popped" has had some form of TCA -although its not the producers fault, its still annoying. I dont care what the closure looks or sounds like, I just want to enjoy my wine. The other day I stumbled onto a Laroche Pinot Noir form the south of France,stelvin closure, that was great for 14$. a strong recommendation for wednesday night appreciation! This is an awesome site. I found you by browsing on Blog Explosion. Since you are really into food, I think you'll be interested in FohBoh, http://www.fohboh.com/?i=28chblcn8r176, which is the International Social Network Site for the Restaurant Industry and Foodies everywhere. There's a vibrant wine community on the site with internationally known somelliers and reps from some of the worlds best vineyeards. I think you would definitely find value on the site you could incorporate into your blog. Cheers! I love the stelvin and has done great in several trials where technical faults have been rated. Much better than the screwcap as far as reductive qualities are concerned. I'm all for abandoning tradition if the wine can be saved. What do you think? I believe it is great! Exactly, no doubt that Italy is the best place practice. I am totally down with the traditional popping of the cork however seeing wine as an everyday beverage that is also an indulgence makes the vino-lock most appealing in my opinion. italy is indeed an expansive playing field! We are a manufacturer and exporter in China specializing in wine & spirit accessories and related artwork design. Besides, we are the strategic partners of several manufacturers to tailor-made different wine & spirit accessories. Our company welcomes the OEM and ODM customers. We specialize in tail-made wine accessories. We can offer gift packs to customers with personalized designs and logos. Please visit our website for more information. Garlicoon, the Food & Wine Network has created a space for Wine Bloggers to introduce and promote their Blog. Join our Wine Blogger's Group at http://www.garlicoon.com/group/winebloggersgroup and connect with other Wine Bloggers. It's going to provide tips and tricks about anything and everything in the culinary world. Please check it out! Tell your friends. When it comes to wine, there is no ingredient more important than location. The land, air, water and weather where grapes are grown are what make each wine unique. I, as a wine enthusiast, believe that a wine’s true origin should clearly be identified on its label so that I can make an informed decision when purchasing and drinking wine. If you agree with me, you should sign the Petition to Protect Wine Place Name and Origin. By doing so, you are joining a growing list of consumers and wine regions like Napa Valley and Champagne France, in demanding that wine labels maintain and protect the integrity of wine place names. To sign the petition, go to: www.protectplace.com. I love wine here,Here wine is everything for me. your blog is too fine.